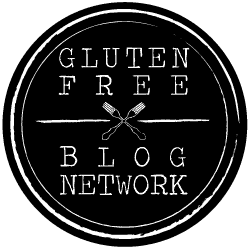 I always feel a little silly writing “Gluten Free” in a recipe title – after all, everything I cook is gluten free, I couldn’t eat it, otherwise! 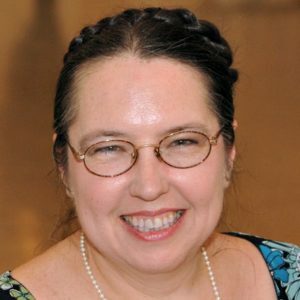 – but I’ve learned that this makes it easier for other people just looking for something they can eat, who may not be familiar enough with Inhabited Kitchen to know, and who might otherwise just skip recipes for baked goods. 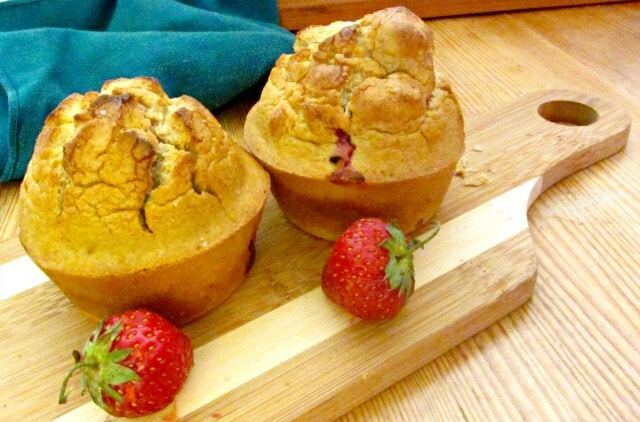 But these gluten free strawberry muffins are good enough for everyone to eat, whether you avoid gluten or not! Baking muffins, as I wrote then, is a good way to experiment with different kinds of flour, and learn their properties. And I have learned about gluten free flour. I made the Apple Cinnamon Muffins with a blend of rice and millet flour, but found that while it was pretty nice, it was also a little sandy, and bland. I wanted better texture and better flavor. 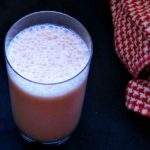 Flavor first – I have since learned to mix millet and sorghum flours half and half for a mild but pleasant flavor, without the gritty feel. Texture? I needed something with a slight… stickiness… to give it a nice crumb. 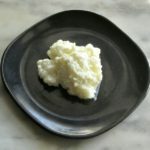 I often use masa harina for this – it’s readily available, inexpensive, and has a mild flavor, but I wanted to have an option for people who can’t eat corn. Teff worked beautifully in the Gingerbread Muffins, but it does have an assertive flavor – a feature in a spice muffin, but not others. But – buckwheat… I noticed the viscosity when I made pancakes. But the toasted buckwheat we usually get is definitely assertive… I love it, but it does stand out. That’s toasted buckwheat, though… I read some things about using raw buckwheat, and grinding your own, and… Then I happened to buy a bag of Arrowhead Mills, and was surprised (when I opened the paper bag) to find how light it was! I’m so used to the default buckwheat being toasted… (This is not, BTW, a sponsored post, an endorsement, any affiliation whatsoever, I’m just telling you the brand that I found that worked for me in this recipe. I’m sure there are others, I just don’t know what they are. Yet. And of course I don’t know brands outside the US.) 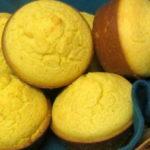 The flavor is very mild, you can see the stickiness in the batter, and the muffins rose beautifully. Preheat the oven to 425°, and grease a 6 cup muffin tin. Wash your berries – or other fruit – and cut them if needed so that you have half a cup of small bits of fruit. More or less blueberry sized – I did cut all the strawberries at least in half, some in quarters, but I would not cut, say, a large blackberry, for reasons of texture. Put a small bowl on your scale, and measure out 80 grams of millet flour, 80 of sorghum flour, and 40 of buckwheat. (Or 200 grams of your preferred flour mix, if you’d rather – I’m probably going to just mix up a batch of this flour blend for use all summer… I think most blends should work, but I can’t, obviously, guarantee them – the muffin will not be quite the same.) Then add a pinch of salt, a teaspoon of baking powder, and blend well. Set aside. In a slightly larger bowl, beat one egg. 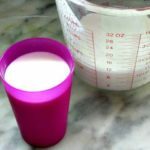 Then add three quarters of a cup of milk, two tablespoons of a neutral flavored oil of your preference (I generally use canola oil, but I find people have strong preferences – the key here is that the flavor not intrude) and a teaspoon of vanilla extract. Beat all this well. 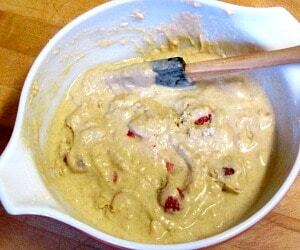 Toss the fruit – strawberries, here, or other – in the flour mixture to coat – this helps prevent clumping. 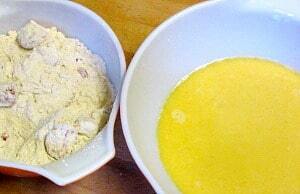 Then add the flour mixture to the milk and egg mixture, and stir until well blended. 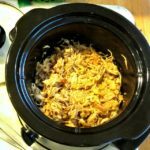 (Again, without gluten, you don’t have to worry about overmixing!) Pour the batter into the muffin tin, and bake at 425° for 25 minutes. What on earth can I eat, if not wheat? 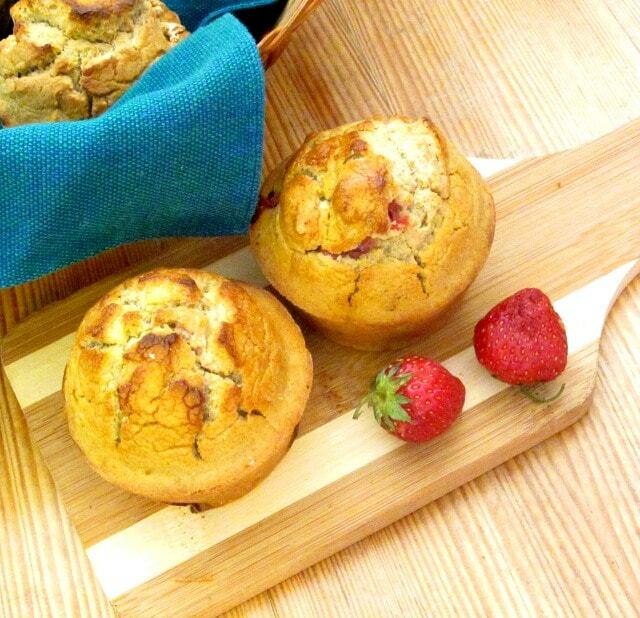 Well – warm, homemade, gluten free strawberry muffins… Not bad at all. 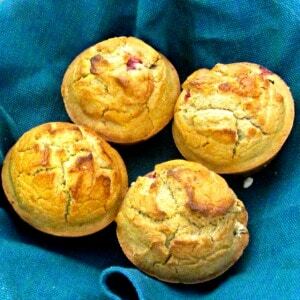 These Gluten Free Strawberry Muffins are also whole grain - no added starch or gums. 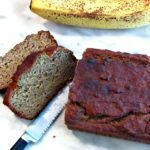 Use the base recipe all summer with other fruit! Preheat oven to 425. 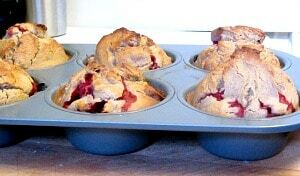 Grease 6 cup muffin tin. 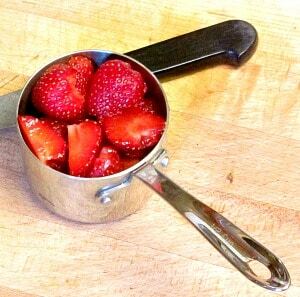 Wash and cut strawberries (or other fruit) so you have half a cup. Place a small bowl on your scale, and measure the three flours into it. Add baking powder and salt, and blend well. Set aside. Beat an egg in a somewhat larger bowl. Add milk, oil, and vanilla, beat well. Toss the fruit in the flour mixture to coat. Add flour mixture to the wet mixture, and stir well to blend thoroughly. Pour into greased muffin tine. Bake at 425 for 25 minutes. Remove from oven and let rest five minutes, then remove from baking tin, and serve. These look great. I do not eat gluten free, but I think I'd enjoy these anyway. Thanks for the info on how the different flours affect the muffins. I don't eat gluten-free, but I like to try baking without gluten for friends and family. And these look so good! You're welcome! When I started, I found that I was just told to use this or that without explanation... And I always was one of those kids who asked Why... ;-) I'm sure some of my readers are, too (like draws like, you know) so I explain things (when I know the explanation - I don't always. Yet. I'm working on that.) And you know - I really do think these are good enough even if you don't Have To eat them... Light and tender. I'd love to top these with ice cream! These look awesome! Oh, well, that takes it in another direction - and would be quite a treat! Thank you, and enjoy them! 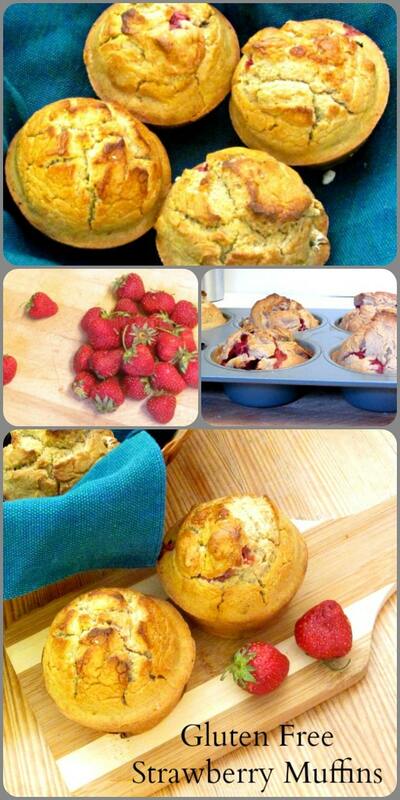 Oh wow, you know you've hit gold with a muffin recipe when you see such a glorious muffin-top! Yum! I must admit, I was so pleased with that lovely rise... They're light and tender, and just what I wanted! Thank you! These look delicious! Sometimes I feel like gluten-free muffins are really dense and pat, but these look light and they rose so high. Love the fresh strawberries. Can't wait to try! I hear you - or else they're so full of starch (in an effort to avoid that) that they fall apart, go stale in about five minutes, and have no flavor. I think this blend of flour solves both of those problems, if I do say so myself... Mild flavor, nice tender crumb, high rise... Enjoy them! Excellent recipe. Imam going to book mark it and bake these for my friend who is gluten intolerant. Thank you! (I love to hear things like that...) I hope you both enjoy them! So glad I just found your blog on Instagram. These look delicious! I'm going to try these for my daughter and I. I don't like the taste of sorghum flour so I might try brown rice. Do you think that would still work? Thanks!! It should - in fact, that's a more common combination. (And I used it in an earlier recipe for apple cinnamon muffins.) Rice flour is occasionally a little gritty - but hydration helps that. If that's a problem you have ever had, let the batter rest for half an hour before baking, that should mitigate the issue. Otherwise, I just use sorghum for the flavor. Before I went gluten free, I ate mostly whole wheat, so just rice and millet flour tasted bland to me. But that's quite personal - feel free to switch back! And enjoy the muffins!